Designed to apply tape as you walk. 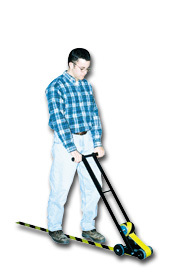 Solid steel construction with comfortable hand grips and durable rubber wheels allow for easy operation and maintenance. Features a soft rubber applicator head. Holds tape rolls with a 3" diameter core and widths between 1" minimum to 4" maximum. FOB Shipping Point.